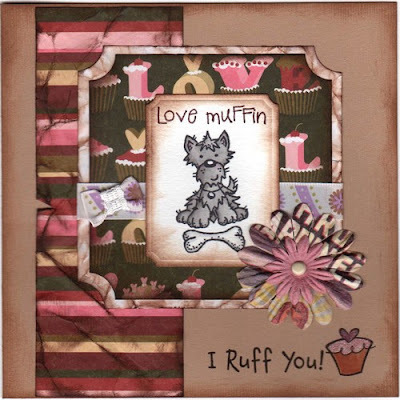 Stamps/Image: Angus the dog with bone from Sugarnellie. + Cat's Pajamas stamps. And inside: Dexter the Bear by Little Cotton Rabbits also Sugarnellie.Paper: Bazzill cardstock. Love papers from Your crafts beautiful. Embellishments: Prima flowers and MM brads. The patterned Ribbon is from CraftLover - Fancy. I've used the Spellbinder Nestabilities - Small Labels - on the stampmotif. And an corner puncher from EK success. Kjøpte nylig noen ny-delige stempler fra Motivet; Doraline med marihøne/nyckelpiga, og James og ShyBear (Artful Stamper). De to sistnevnte har jeg sett brukt på kort rundtom på flere blogger, og ble helt forelska! gleder meg til å bruke dem :) Her har jeg brukt Doraline på et kort til motivets egen skisse-utfordring - se skissen på bloggen. Recently I bought some gorgeous stamps from Motivet, Doraline with ladybug, and James & ShyBear (Artful Stamper) - wich I'm so looking forward to play with!! I've used Doraline on this card for the sketch-challenge at Motivet's blog here. Stamps/Image: Motivet - Doraline with ladybug, Cornish Heritage Farms - Distressed cicles scrapblock stamp, Magnolia - BakgrundsSwirl Bröllup. Paper: Bazzill cardstock. My Minds Eye - Tres Jolie - mon cheri 'baby' girl: Floral / Corail paper. And I used H2O - copper shimmer mist, to make the paper under the stamp-motif. Some of my Penny Black sweethearts! Denne ukens utfordring #39. hos the CuttlebugSpot er å vise frem innsiden av et kort man har laget. Ble veldig fornøyd med dette jeg, men jeg pynter alltid innsiden på kortene mine! :) Er ikke Penny black musene skjønne? Jeg får aldri nok av disse stemplene! 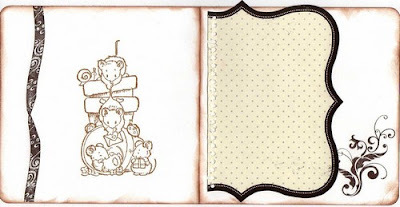 Stamps/Image: The mice with muffin are from the Penny Black Clearstamp set 'Critters', and on the inside PB - Surprise!! 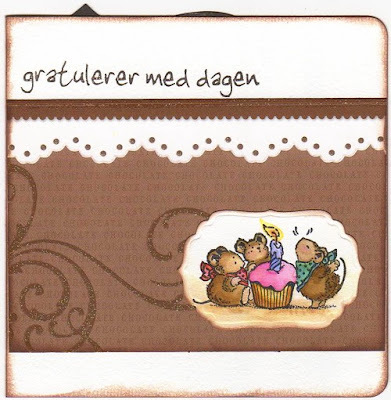 The text reads 'Happy birthday' and come from Scrapmagasinet - 27B. And the ribbon stamp is also from Scrapmagasinet - 36B. The swirlstamp is from Lazar StudioWERX Inc - Funky Holidays set. 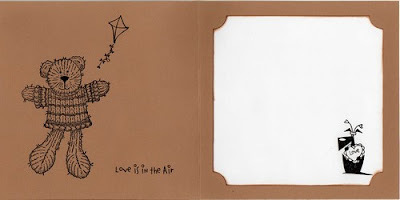 Paper: White Bazzill cardstock, DCWV - sweet neapolitan gltr., and inside a Noteworthy diecut journaling paper from M.M. Embellishments: As always (almost) I distress my cards with my small cats eye pads - don't know what I'd do without them! And I've used Spellbinder Nestabilities - Labels 4 on the front stampmotif. A couple of summer cards to cheer me up when the weather here is dreary and wet & make my joints ache! ;) For the challenge at A spoon full of sugar #58 - Summer. 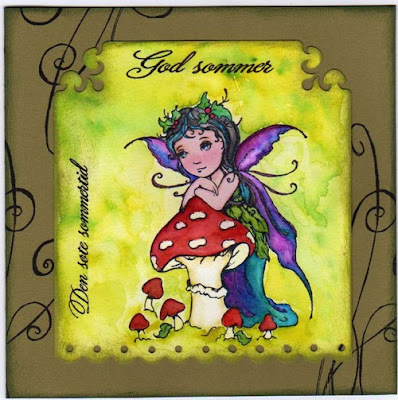 I *love* theese Fairy Song Art stamps from Susana's Custom Art & Card Design. 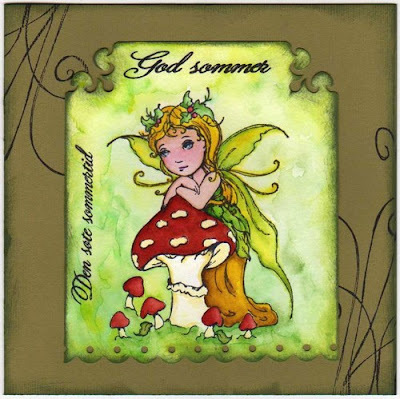 Stamps/Image: Fairy Song Art stamp - Lost in thought. Magnolia - BakgrundsSwirl Bröllup. The txt is from Northstar stamps and reads something like: 'the sweet summertime' & 'good summer'. Paper: Bazzill cardstock and aquarelle (watercolor) paper. Embellishments: I've painted the images with H2O, distress inks and aquarelle paints. And the punches used are from Fiskars (scallop) and EK Success (corner).